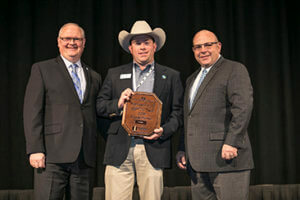 Andrew Taylor, Florida YF&R President (center) receives the Harvest for All award by Greg Taylor (left) and Zippy Duvall, AFBF President. Florida Farm Bureau’s Young Farmers & Ranchers received top honors for donating 24.6 million pounds of fresh produce and other foods to assist hungry Floridians as part of American Farm Bureau Federation’s (AFBF) “Harvest for All” program. Now in its 16th year, Harvest for All is spearheaded by members of Farm Bureau’s Young Farmers & Ranchers (YF&R), but Farm Bureau members of all ages from across the nation contribute to the effort. The awards were presented during AFBF’s Young Farmers & Ranchers Conference in Reno, Nevada, in February. Since Harvest for All was launched, Farm Bureau families have gathered more than 275 million pounds of food, logged more than 157,000 volunteer hours and raised $7.5 million in donations.